“Fire ants” get their name from their painful (burning) stings. Originally from Brazil, they were introduced to the United States between 1933 and 1945. In 2006, the USDA reported that their damage and control costs exceeded $6 billion a year. Mainly outside nesters, they will sometimes nest indoors in areas of exposed organic debris, such as bath traps; outdoors, they will nest adjacent to foundation walls. The mounds of these ants can grow to more than a foot high and several feet in diameter. They are relatively easy to see and avoid. Several tunnels run just under the soil surface extending out several feet. Single queen mounds typically have 80,000, but can have up to 250,000 individuals per colony mound. Multi-queen mounds may contain fewer individuals per mound. There can be several hundred mounds per acre. Death can result from large numbers of fire ant stings. 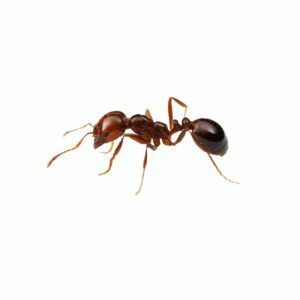 Fire ants are especially concerning in hospitals and assisted-living facilities where patients/residents may be immobilized. Fire ants show attraction to electrical junction boxes of traffic signals, air conditioners, etc. When they amass around the electrical contact points, they can cause the equipment to malfunction. They will also nest in gas and water meter boxes and then follow the pipes into the building. Head and thorax yellowish red and abdomen black. Head and thorax yellowish red and abdomen black. Workers measure 1/16-1/4 of an inch (1.6-6 millimeters) long. Queens are about ¼ of an inch (6.6 millimeters, but up to 8 millimeters) long. Southern United States, but occasionally found in shipments containing soil (e.g., potted plants) to northern states. Prefer food with high protein content, but will feed on almost anything, plant or animal. They are particularly destructive to vegetation. After heavy rains, a fire ant colony may form a ball of ants and “raft” the flood waters until encountering dry land or a building. They often arrive hungry and defensive, which can be dangerous for small animals, children and immobile patients or elderly. Often large areas need to be treated annually and buildings should be monitored at time of flooding.